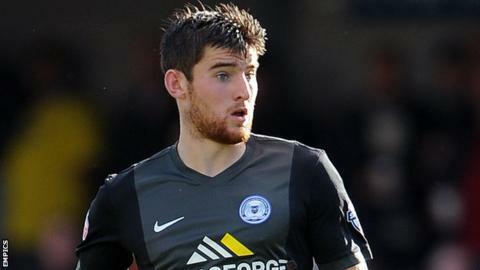 Peterborough United defender Jack Baldwin will be out for up to a year after rupturing a knee ligament. The 21-year-old will require surgery on his anterior cruciate ligament after coming off in the first half of Saturday's 2-1 loss to Scunthorpe. "It's a massive blow for the club, but first and foremost for the player," boss Darren Ferguson told BBC Radio Cambridgeshire. "We have to help him through the next 10 to 12 months." Baldwin joined Posh from Hartlepool in January and has gone on to feature 24 times for Ferguson's side. "It was innocuous. His studs just caught in the grass. Many players have had this injury in this day and age and come back stronger," said Ferguson. "The boy is devastated but players come back from these things. "I'll keep him busy. He'll become one of my scouts now."